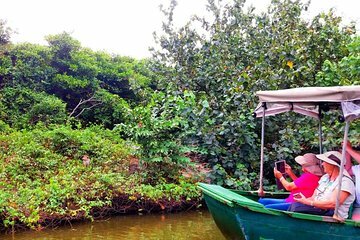 Discover the wildlife and beauty of Muthurajawela Marsh on a 2-hour private boat trip from Kochchikada, Negombo or Waikkal. With a professional guide, board a boat and cruise around this beautiful, wildlife-rich wetland. Absorb the tranquility, glide around mangroves and inlets, and learn about the fragile ecosystem from your guide. Watch for herons, water monitors, birds and even crocodiles, and either before or after your boat ride, choose to visit a fishing village for a glimpse of local life. Price is per person, based on a maximum of 15 people.